Purchase Glorious God, Glorious Gospel along with the children's Coloring together at a special savings. Who is God, and what is He like? Why do I exist? How am I to act toward God? What is my greatest problem and need? What has God done to solve this problem? How can I be saved? How should I now live? This family devotional is designed to help your children answer these important questions and ground them in the essential, foundational, and glorious truths of the Gospel. 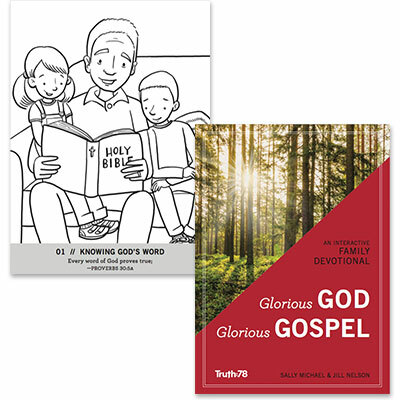 As your family reads, discusses, and applies the truths expressed in the Glorious God, Glorious Gospel family devotional, this Coloring Book can be used to engage young children’s minds. It keeps little fingers busy in order to help them refocus and absorb the main ideas you are presenting as you instruct the mind, engage the heart, and influence the will.